APRIL 2019 RETAILOBSERVER.COM 31 A NSWER: For the incredible opportunity to source the newest, most innovative products in the industry, to negotiate deals with their business partners and vendors, to learn about a multitude of subjects important to their industry, and to network and see old friends – all under one roof. That's what happened in January at TISE 2019 in Las Vegas, held at the Mandalay Bay. TISE celebrated yet another year of powerhouse industry attendance, exhibits, product displays, and education. Attendees from 77 countries and from every corner of North America came to buy, source, network, and discover what's new, needed, and up-and- coming for their businesses. More than 800 brands (135 of them brand-new to the exhibition floor!) presented their products in over 1 million square feet of exhibits, product showrooms, features, and education spaces. Each showroom offered beautiful displays and unique demonstrations, amounting to thousands of products and services for the industry to discover for their businesses. The exhibit hall featured the return of Shaw Industries, who presented their Anderson Tuftex, COREtec, and US Floors lines; as well as a host of creative displays and events from Mohawk Brands: Mohawk, Quick Step, Daltile, Marrazzi/ American Olean, PERGO, IVC, and Godfrey Hirst; plus large sets from Mannington and Engineered Floors, as well as other spectacular flooring, stone and tile displays. 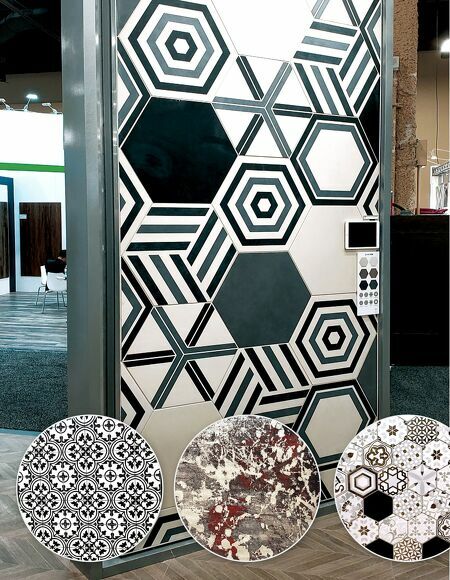 Brands exhibiting at TISE offered products from every aspect of the residential and commercial sectors of the flooring, tile, and stone industry, including hard goods, soft goods, equipment, tools, supplies and services, and so much more. This year's market was a riot of discovery for all of the senses across the entire exhibit hall. 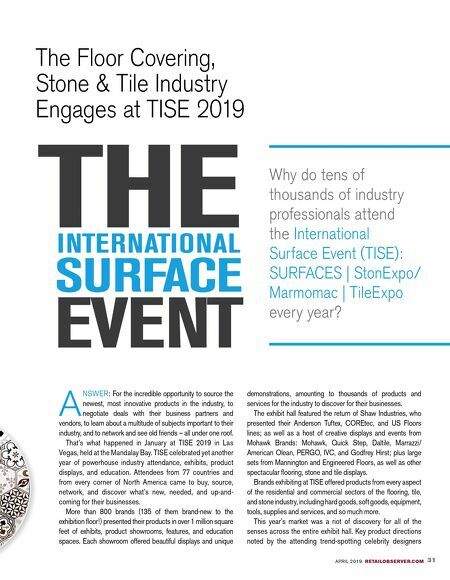 Key product directions noted by the attending trend-spotting celebrity designers The Floor Covering, Stone & Tile Industry Engages at TISE 2019 Why do tens of thousands of industry professionals attend the International Surface Event (TISE): SURFACES | StonExpo/ Marmomac | TileExpo every year?